Give Yourself a Break: A Review & a Giveaway! As children we're taught to treat others the way we would like to be treated. But as adults, we often need to turn that old maxim around. We're good at showing compassion to other people--but many of us have trouble showing that same compassion to ourselves. We say things to ourselves we would never say to a friend. And all this negative self-talk can have a devastating effect on our lives and relationships. 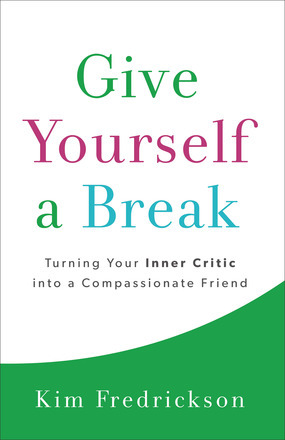 Licensed marriage and family therapist Kim Fredrickson wants you to stop beating yourself up. Grounding her advice in Scripture, she offers practical steps, specific exercises, and compassionate words to say in order to build a loving relationship with yourself. Through inspiring stories of transformation, she'll help you learn to show yourself the kind of grace and understanding you offer to others--and to change your relationships, your outlook on life, and your view of yourself in the process. Of course, I read this book through the lens of chronic illness and disability. We are probably more in need of this book than healthy readers are, honestly! We're so hard on ourselves, hardly ever granting ourselves grace. And so much of our lives is out of necessity focused on ourselves, we refuse to spend any extra effort of self-care. This book is written in a very caring way. Not only that, but it gives practical guidance and step-by-step instruction on how to go about caring for ourselves in a way that is NOT selfish or neglectful of others. I would highly recommend it, and am excited to give away a copy today! For a chance to win, please enter the widget below. You can purchase the book here or here. * I received a complimentary copy of this book from Revell, in exchange for my honest review. All opinions are my own. ← Are You Listening for the Whisper? Wow - truer words were never "penned", Shelly! Well, yes there are other "truer words" but I know I can relate to all you shared. I am one who is first in line to encourage another and "last in line" to give myself the same grace. I am glad to know about this book - obviously this reality is widespread! I am always getting ' words" that tell me I am my own harshest critic so am pleased to learn of this book. Thanks for hosting and sharing, Blessings!! This looks very cool, Shelly. My computer is being silly (something about cookies and stuff-- not the kind you eat, apparently) so it won't let me enter the contest. But praying someone who really needs it gets this book. Thanks for sharing and for your generosity.